I love harvest time every year! The long hours in the garden are finally paying off, and while we enjoy fresh fruits and vegetables, we can’t possibly eat all of them now. So I needed to learn how to freeze fresh produce to help me save the garden harvest for later use. 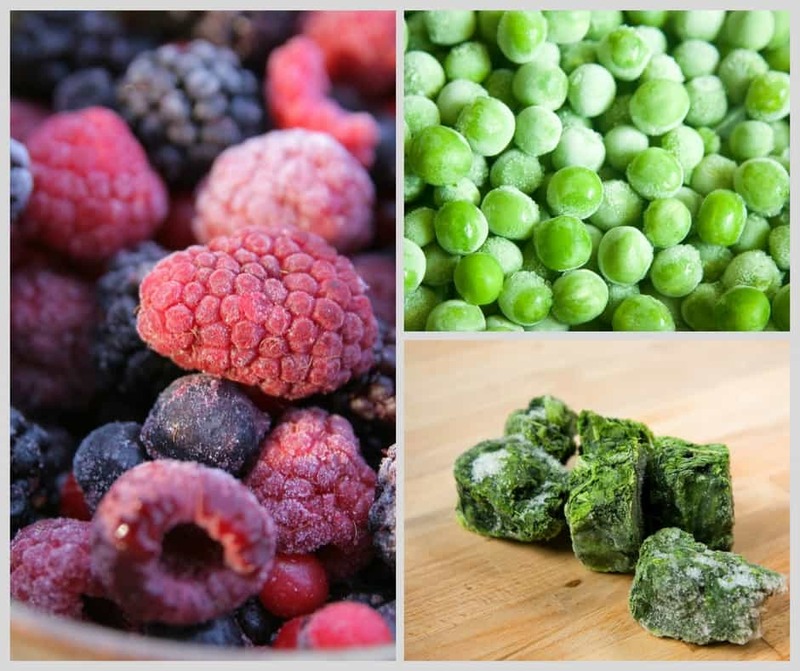 Did you know that there’s more than one way to freeze your produce? You can freeze your fruits and vegetables just as they are from the garden. But if you do it this way, it’ll take more space. If you don’t have a lot of space, you might want to chop them up a bit, or even puree. Freezing chopped up veggies and storing them in the right portions can make it easy to cook later on. Remember to label everything really well, including the date. Berries are easy to freeze whole and all you need to do is wash them and freeze them on a sheet before adding them to a Ziploc bag. You’ll be able to use them on your cereal add them to smoothies, or make a pie with them. Grapes freeze very well, and are great to at as frozen candy on a hot day. They are not the greatest once thawed, so just use them frozen, or in your smoothies. Small cherry and grape tomatoes freeze well whole. Use them later to make a chunky sauce for pasta, make a cream of tomatoes soup, or roasted tomatoes with garlic. YUM! Fruits like peaches, bananas, and pineapple freeze better if you chop them up first (after you peel them, of course). for example freeze really well, but it’s much easier to peel, and chop them first. Lots of veggies can also chopped and frozen. Green beans, peas, red and green peppers, broccoli and cauliflower freeze very well. Think of it this way: if it’s in the freezer section at the supermarket, you can safely freeze it too. Most veggies (all of the above) need to be blanched before freezing to preserve their vibrant colors and stop the enzymes that could spoil them faster. But there are some vegetables that you can freeze without blanching: tomatoes, winter squash and tomatoes are in this category. 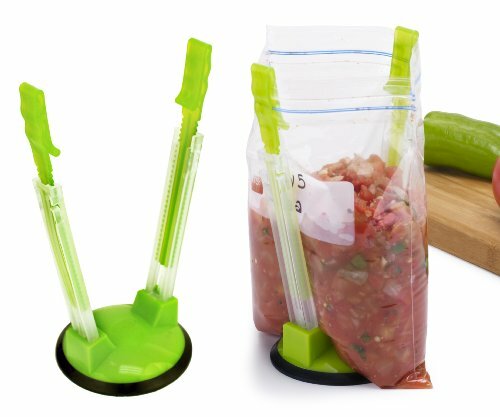 Hands-Free Baggy Rack Clip Food Storage Bag Holder, 2-Pack – Great for pureed frozen harvest If you’re freezing it for soup, sauce or pie, it can be frozen after you puree it (here’s my favorite way to puree my harvest). It’ll make it very compact to freeze and it’ll take up the smallest space in your freezer. Of course, you’ll need to use up your entire container. It’s a good idea to frieze pureed fruits and vegetables in smaller containers for most efficient use of your harvest. Apples and pears freeze well only after you puree and cook them first. Strawberries, tomatoes, butternut squash, yams, broccoli and cauliflower are good candidates for freezing in pureed form. If you’re growing tomatoes, the month of August will give you plenty to east and freeze some too! Take some time to make your favorite meals and freeze them for later use. I do this a LOT!!! Making twice to three times the amount of a dish won’t take double the time, but will save you during the holidays or any other busy times that are sure to come unexpected. You can freeze soups and stews this way: eat some now, and freeze the rest for a rainy day. 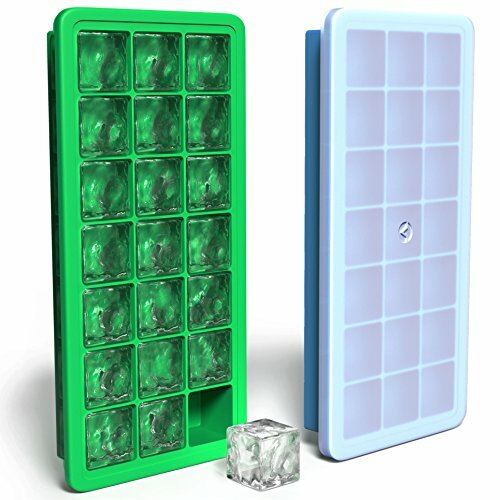 Ice-Cube-Molds, Blue, Green Herbs bring our meals to live, and I couldn’t imagine not freezing my herbs. The best way to freeze herbs is to chop them up and put them into ice-cube trays covered with either oil, water, or broth. Once frozen, you can pop them out of the trays and store them in a freezer bag or container. I hope I’ve inspired you to get busy freezing some of your harvest. And now that you know how to freeze fresh produce it should be easy to do. Please share in the comments what you are freezing this month. This is really helpful! My parents’ garden always produces a ton of stuff all at the same time but I never know what to freeze. So helpful! Thank you so much. These are great tips! I never really think about freezing a puree!